I’m amazed at what a person can do with simple materials. (I remind myself that great novels are written one word at a time.) 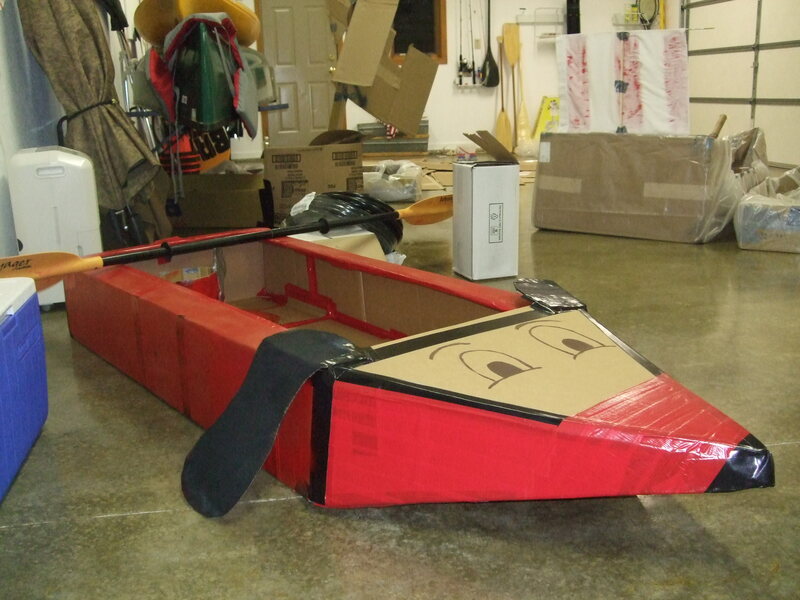 We witnessed a cardboard boat race at a local pool, so my daughter-in-law challenged the family to a cardboard boat race.An internet search yielded a design, but no instructions. (Google: cardboard boat design.) Lowe’s gave me a huge sheet of cardboard, the exact size recommended and I bought $30 worth of duct tape. That’s it. Measure and cut carefully as if sewing a dress or cutting wallpaper, so corners fit neatly. The hardest part was folding the long sides, but Bob helped with that. Heavy-duty duct tape on all seams kept the water from seeping in immediately. 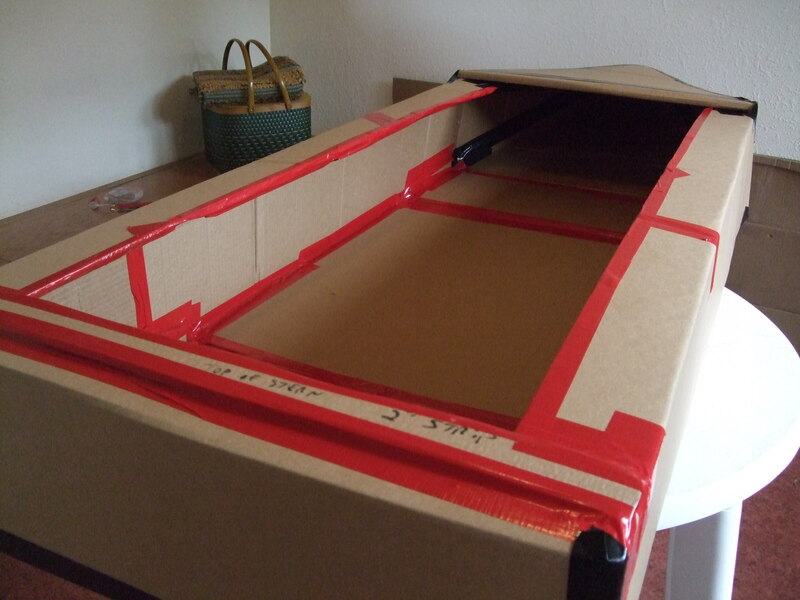 Additional cardboard to reinforce the sides and bottom is imperative and prevented the boat from folding in half. Your boat must be long enough (about 86″) and wide enough (29″) to support your weight. The side walls are 10″ high and 4″ wide. The nose of the boat looked like a dog’s nose, so I drew eyes. The only spray paint we had was red . . . so we named it Clifford, The Big Red Dog, as in the cartoon. Note the plastic covered boats in the background. Cute themes: Cleopatra’s barge, Monster Flush, Shark, Pirate ship. Nine in all. A few of them finished the race. Most sank. The pirate tried to sink me, but Clifford stayed afloat and won the race. Clifford survived to race again in next year’s challenge.Everyone got into the spirit of the race (themes, costumes, kids, adults). Fishermen gaped at the hillarious event. More pictures are on my Facebook page: Jeanne Meeks. 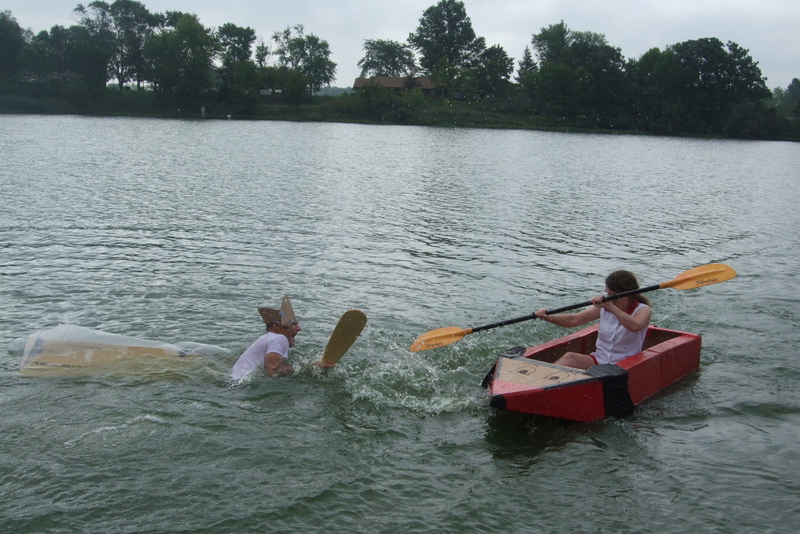 I googled the 2010 MN milk carton race. Wow, elaborate boats. But I don’t see any milk cartons. I love silly fun like that. This is a cute idea. In Minnesota they always have Milk Carton Boat races during the Aquatenniel. There’s always a bunch of crazy (and sometimes non-floating) contraptions.